When you hear this song you will probably recognise the production values of Jim Steinman immediately: with its backing vocals and high speed music, it's an almost hysteric piece of music. 'Holding out for a hero' was originally released in 1984 and included on the soundtrack of the movie 'Footloose'. It later appeared on Tyler's 'Secret dreams and forbidden fire' album. The single peaked at number 2 in the UK singles chart and number 34 in the US Billboard Hot 100. In the Netherlands, the single flopped mercilessly. 'Total eclipse of the heart' is one of those singles I thought I had for years, and then one day I discovered I didn't have it. It still didn't get to the top of my want list, because it's also one of those songs that have been played to death on radio and television in the mid-Eighties, the time when I was actually hooked on those media. 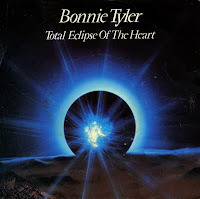 The song remains Bonnie Tyler's most successful song, peaking at number 1 in the United States, Australia, Canada, and the United Kingdom. In the Netherlands, surprisingly, it didn't do so well, peaking at number 24 in the Dutch Top 40. It's still a radio favourite these days.